While on my trip to Northern California to visit some dear friends I contemplated how I would honor my compassionate eating practice while traveling. As I was corralled in an out of airport lines, deprived of my water and questioned about my herbal supplements I made an unexpected and delightful discovery. Here’s what happened… I had finally made it through security, after having my bags opened and searched after it was discovered that I had packed home-made pickled beets and cucumbers that my friends mom had canned. Fortunately they concluded that it was not a bomb. I had to pour my water out of my canteen which would inevitably force me to support Coke or Pepsi if I got thirsty during the next 4-5 hours of my journey. I begrudgingly lingered at a vending machine with my two dollars trying to decide whether to buy bottled water from companies I’d rather not support, or have to buy snacks that I knew had chemical flavorings and GMO ingredients. I was about to put my money in thinking I had no choice but my intuition told me not to. As I turned to walk away I saw it. The Redding airport had an organic vending machine! I almost ran to it gleefully and began to scan the items inside. There was an assortment of organic veggie chips, fruit and nut mixes, organic juices and natural spring water. Each claimed to be made of wholesome ingredients and recycled packaging. I was so excited I took a picture. I truly hope to see more of these alternatives available in public places and especially schools. Children and youngsters would greatly benefit from eating more wholesome foods as a preventative measure to insure they don’t develop diabetes, obesity and even behavioral problems. It can be hard to avoid many of the over-sweetened, chemically flavored foods because they are so heavily marketed to them and sometimes the only option available. 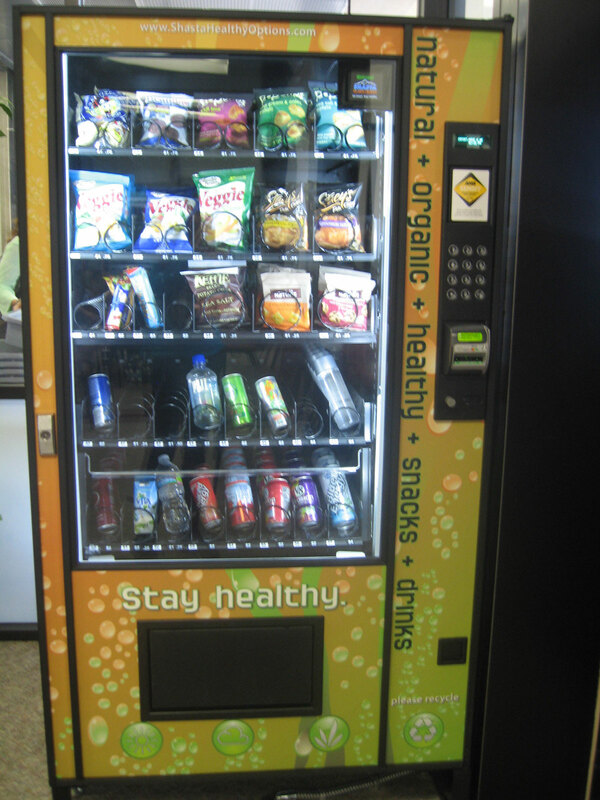 Seeing this little vending machine gave me hope for a more compassionate future and that more people are becoming aware of what they are eating and supporting positive change with their choices. Happy snacking!